Their response, and remarks by Republicans focusing on the threat from the Islamic State extremist group, underscored how the mass killing in Florida touched on a range of political issues just months before elections in which control of the White House and Congress are at stake. Top Democratic senators told reporters they’d seek a fresh vote on a proposal by Sen. Dianne Feinstein, D-Calif., that the Senate rejected last December in a near party-line vote. Judging from that vote, the Democrats’ latest attempt is likely to be difficult. Democrats consider the bill “the logical and first and most likely to pass step” in response to the shooting, said Sen. Chuck Schumer, D-N.Y. Other steps could include trying to expand background checks for gun buyers, he said. Schumer, a member of the Senate Democratic leadership, said he believes Republicans “in a political season are going to find it very, very difficult” to oppose the legislation this time. Senate Majority Leader Mitch McConnell, R-Ky., did not address Feinstein’s bill as the chamber convened Monday but focused on links the shooter apparently had to the Islamic State extremist group. President Barack Obama and administration officials said the shooter, identified by officials as American-born Omar Mateen, 29, was probably inspired by foreign terrorist organizations. McConnell said the U.S. must “fight back” to prevent additional attacks and called on the Obama administration to brief lawmakers on its plan for doing that. Senate Minority Leader Harry Reid, D-Nev., criticized Republicans for the Senate’s 2013 rejection of bills to tighten background checks and curb assault weapons. Reid questioned how Republicans could “campaign for re-election in good conscience” because of those votes. Forty-nine victims died in the Orlando attack and more than 50 were injured, making it the worst mass shooting in U.S. history. Mateen was also killed in the Sunday morning shootings. FBI Director James Comey said Monday that Mateen had “strong indications of radicalization” and was probably inspired by foreign terrorist organizations. Officials said Mateen had twice come to the FBI’s attention, including a 10-month investigation prompted after co-workers expressed concern over statements he’d made about possible ties to terrorist groups. Comey said Mateen was added to a terror watch list in 2013 when he came under investigation and then taken off it when that 10-month inquiry ended. According to the FBI, the government’s terror watch list has about 420,000 names on it of people known or suspected to be engaged in terrorism or planning such activities. Only 2 percent of the names on the list are Americans or legal permanent residents permitted to purchase firearms, with foreigners able to do so on rare occasions. Currently, the FBI is notified when someone on a list applies to purchase a gun from a federally licensed firearms dealer. That often results in increased surveillance of a suspect, but simply being on a watch list is not grounds for barring a gun sale. People undergoing background checks for gun purchases can be denied the firearm if they are convicted felons, have certain serious mental illnesses or fall into other categories. 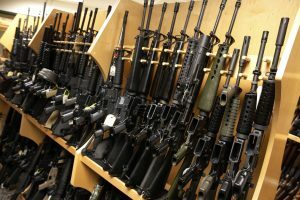 Out of 2,477 times that people on the terror watch list applied to buy guns or explosives from February 2004 through 2015, 2,265 — or 91 percent — were allowed to make the purchase, according to a letter sent in March to Feinstein by the Government Accountability Office. The office is a nonpartisan investigative agency of Congress. The federal no-fly list is a subset of the terror watch list and has about 16,000 people on it, the FBI says. Last December, Republicans offered their own proposal for curbing guns for people on terror watch lists that also fell short in the Senate. That measure by No. 2 Senate GOP leader John Cornyn of Texas would give the government up to 72 hours to block such a sale by proving in court that there was probable cause to do so. Democrats said they would try attaching Feinstein’s measure to a bill financing Justice Department and other programs that the Senate could debate this week. A similar House proposal by Rep. Peter King, R-N.Y., has gone nowhere in that chamber. Congressional leaders arranged briefings on Orlando by administration officials on Tuesday for House lawmakers and Wednesday for senators. Associated Press writers Eric Tucker and Alicia Caldwell contributed to this report.